The Holidays are a crazy time for us all; there's the hustle, the bustle and we are always on the go. Between all the decorating, the parties, the shopping, the cooking and baking, the time just flies by! It's time to recognize all the hardworking women who really make this time of year go off without a hitch! 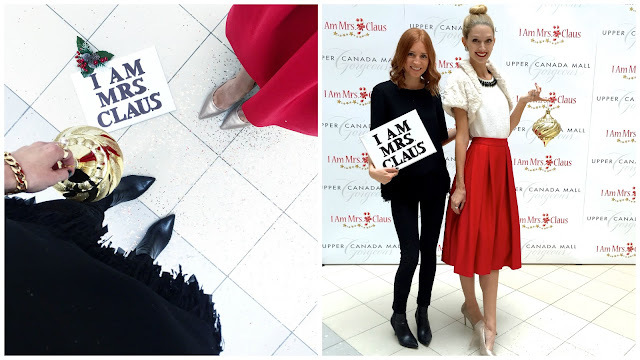 #IamMrsClaus is a campaign spearheaded by Upper Canada Mall to give credit to the all the female powerhouses, who do whatever they need to do, with optimism and magic, to make this time of year special for their loved ones. Mrs. Claus brings the charm and traditions of the season to any occasion, and we can't forgot the glam! She'll rock a fur vest to keep warm while running to pick up gifts, a red parka to take the kids skating, and she'll shine bright in a sparkly mini dress and perfect red lips at the holiday party. She does it all and more. What I love about this campaign is that UCM is recognizing how amazing the modern day Mrs. Claus is. And she's you. And she's me. She's your mom, best friend, aunt, and sister. She's in all of us, in whatever way we see fit! I had such a blast chatting with Upper Canada Mall's very own Mrs. Claus at the media preview of the #IamMrsClaus campaign. They couldn't have picked a more relatable and stylish girl boss (@laceandbraids) to play the role of modern day Mrs. Claus. In a snowy and glittery Q&A period she shared some fabulous tips for the holiday season which any woman, with a full time job or not, could use. 1. Pin a list and check it twice. Pinterest is a fabulous source of inspiration and a great place to get visual. Check out Upper Canada's Mall gift guide on Pinterest here. 2. Avoid the crowds. Extended holiday hours, people! Great way to beat the peak shopping times. 3. Wrapping reinforcements. The Beta Sigma Phi gift wrapping booth at UCM will not only stylishly wrap your gifts, giving you more time to check your list twice, but the volunteers wrap gifts in exchange for a charitable donation. 4. Keep up your energy. Mrs. Claus recommends vanilla cashew milk and some french macarons! I couldn't agree more! 5. Glamour Squad. You may want a blow out or a mani for your next Holiday party, and yes, you can do it all, but there are also professionals, and these professionals have a job, and it's to pamper you! 6. Skip the Lines for Santa. Register for a fast past to meet Santa. He'll be the one sitting in the big chair while the Mrs. Claus in you is running around perfecting every last detail! 7. Gift card. When all else fails, go for the gift card and let personal choice steal the show this season. Ready for a P&P exclusive! I sat down with the Mrs. and asked her two very important questions. 1. What is your ideal Christmas morning breakfast? Anything made by the mister, but preferably a quiche! 2. What will Mrs. Claus be sporting to bed on Christmas Eve? Something red and lacy. I like this lady's style! And there are definitely a few places in UCM that can make that happen! It's no secret that Mrs. Claus has some fabulous style. I rounded up my favourite picks so that you can get her look this season. All stores can be found at Upper Canada Mall. Thank you to Upper Canada Mall and the ladies at Jive for inviting me to the big reveal of the modern day Mrs. Claus! I had such a blast with the other blogger babes chatting, snapping pics and throwing snow around! Be sure to check out the campaign here and Mrs. Claus' Holiday Gift Guide here with gifts curated for everyone on your list, including the hostess, teacher and man friend! You also won't want to miss the Holiday Handbag Contest she will be hosting! What a fun campaign, and great tips! You ladies all look beautiful! Aww, thanks Joelle! It is totally an campaign for the #girlboss in us all this Holiday! Great ideas for managing the holiday shopping with less stress! Love all the red items! Yes- tips from the pro (Mrs.Claus herself)! I am obsessed with the red satin skirt! I am looking for some cool company party ideas so that I can start planning right away while saving precious time and staying in a budget. Good ideas help you save time and money. Many of these tips are used by the best planners around the world.